Sophia Italian Bistro reviews and other related press & news. Lobster nights are nothing new on Long Island, but they don’t usually come with an Italian twist. 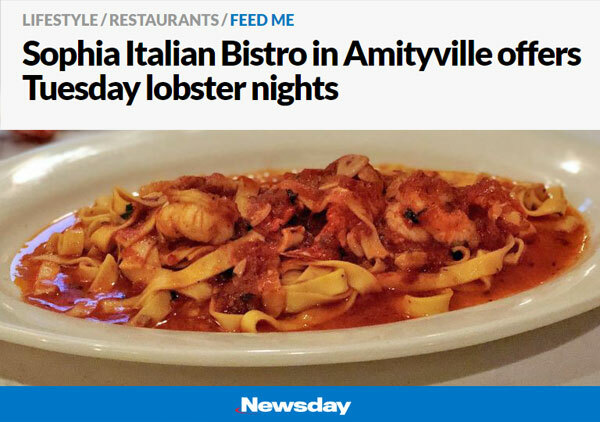 Sophia Italian Bistro in Amityville is bucking that trend: Every Tuesday brings a dinner special that incorporates Long Island’s favorite crustacean into more than half a dozen Italian-style creations — all for $29.95. You can have your 1½-pounder steamed, of course, and the kitchen will split it down the middle for easy access, garnishing the plate with broccoli, corn, mashed potatoes and sausage. You can also order the lobster broiled, stuffed with crabmeat. But why not go for lobster fra diavolo, here conveniently served out of the shell on a huge mound of fettuccine? Or lobster tail scampi-style over linguine, lobster and bay scallop risotto, lobster in a sherry-ginger cream sauce over linguine, a tail-and-sirloin surf and turf, or a tropical salad featuring lobster and shrimp? Each dish comes with a choice of salad or soup (recently, a refined split-pea soup with shreds of spinach) and coffee or tea. On Wednesday night, Sophia offers a comparable steak night, with eight steaks and chops offered, with starter and coffee or tea, for $32. Reservations are recommended for lobster or steak night. 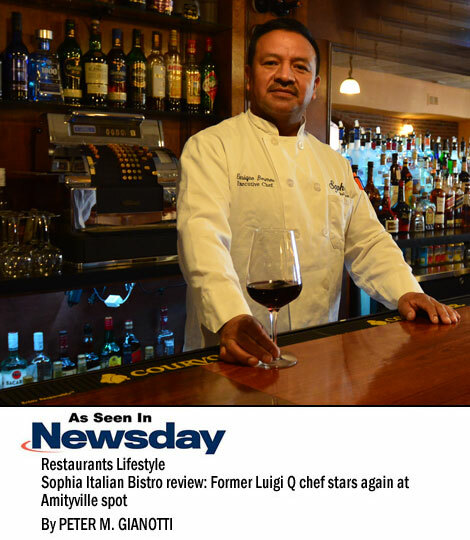 Chef-owner Enrique Bermeo, formerly the chef at Luigi Q in Hicksville, earned 2½ stars from Newsday when he and Richie Sanseverino opened Sophia in 2015. (Sanseverino has since departed.) With its widely spaced tables, separate bar-lounge and reasonably priced menu (steaks and chops are virtually the only items that cost more than $24), it remains a solid choice. There should be more Long Island restaurants like Sophia Italian Bistro. It's generous, calm, unpretentious and honest, with a gifted chef in the kitchen and a concerned host in the dining room. Enrique Bermeo, who deservedly attracted many fans at Luigi Q in Hicksville, is the chef while Riccardo "Richie" Sanseverino presides in the dining room. Although both have been on the local restaurant scene for some years, this is the partner's first ownership venture. The generosity of their new restaurant is evident from the get-go. Instant service of cheese, salami and crusty bread found our table. There's a calm atmosphere created by carpeted floors, sound-proofed ceilings and the absence of intrusive recorded music or blaring televisions. It encourages relaxation and civilized conversation. Mr. Sanseverino is also a warm presence, roaming the dining room with a knowing eye along with his kind wait staff. Sophia's unpretentious menu doesn't try to knock diner's socks off or offer cutting-edge dishes for shock value. Rather, it aims to seduce patrons with familiar preparations like baked clams oreganata, penne vodka, veal saltimbocca and chicken scarpariello. The quality and size of portions justify the reasonable prices that often are in the teens and low twenties. Welcome little touches don't bowl anybody over, nevertheless attest to the effort and concern that illustrates Sophia. For instance, the vegetable salad is a bountiful chopped bowl of veggies enhanced by some unexpected but welcome mango ($10). Warm grilled pulpo (octopus) is cut into bite-sized pieces, marinated in garlic and lightly touched with lemon and parsley ($14), all of which lets its flavor come through loud and clear. Two predictable starters—eggplant rico, with ricotta and mozzarella with a gentle filetto sauce ($10); and soft burrata boasting deeply ripe tomatoes and roasted peppers ($12)—both hold their own. A surprisingly substantial shell steak with vegetable and potatoes ($28) is a best buy recommendation. Half of an oven-roasted Long Island duck was slightly chewy but greatly enhanced by its orange demi glace ($26). A generous helping of grilled salmon in Dijon mustard sauce ($24) was slightly dry. But the veal saltimbocca ($23) was everything it should be. The first hint: those long, hot Italian peppers. A fiery opener, they're finished with pepperoncini, pan-roasted garlic and extra-virgin olive oil, and guaranteed to awaken any appetite. Diners may remember the explosive flavor from Luigi Q, the excellent Italian restaurant in Hicksville. Enrique Bermeo has made sure they give off sparks in Amityville. Bermeo cooked at Luigi Q, and his soulful dishes often are just as vivid here. He joins Richie Sanseverino, a veteran of Tesoro in Westbury, to unveil this very welcome newcomer. They took over the former site of Villa Avanzo, refurbishing and retooling the old spot Sophia Italian Bistro arrives warm and welcoming, with exposed brick and polished wood, but more so because it has a genuine personality. Never pretentious, dependably satisfying, it's a restaurant where you could eat once a week and be very content. So, start by sharing those peppers and balance the heat with some good bread. Cool off with the glistening seafood salad of well-dressed shrimp, scallops, squid and octopus. Turn a little more contemporary with a lustrous tuna carpaccio, accented with lime and ginger. The kitchen sends out hearty eggplant rico, with fresh ricotta, mozzarella and a quickly cooked tomato sauce. Baked clams oreganata: reliable. Likewise, fried calamari. But the hefty stuffed artichoke arrives with more than a few singed petals. Spinach ravioli, light and tasty, are sauced with fresh plum tomatoes. Orecchiette oronzina translate into respectable pasta tossed with broccoli rabe, cannellini beans, Gaeta olives, sun-dried tomatoes and sausage. The sauce for the gnocchi at pesto tastes delicious, but the gnocchi are heavyweights. Cortecce, similar to oversize cavatelli, have the right texture, but the eggplant-driven sauce is surprisingly bland. Seaside, chef Bermeo excels with baked Dover sole, simply prepared with white wine and lemon; and snapper alla Livornese, emboldened by capers, olives, onions and tomato sauce. 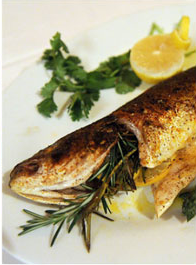 Whole roasted branzino swims in moist and light, with herbs, garlic and lemon. Bermeo also prepares a juicy pork chop, atop hot cherry peppers and caramelized onions; and a diverting, first-class roasted Long Island duck, glistening from an orange-infused demi-glace. On the side, with these or any other main course, try the baby spinach with cherry peppers, broccoli rabe with garlic and olive oil, or escarole with white beans and garlic. The obligatory desserts are cheesecake and cannoli. Each is easy to recommend, just like Sophia Italian Bistro. The site of Sophia Italian Bistro was once home to a restaurant owned by one of the partner's in-laws. The winning strategy for many successful restaurants is to have one owner in the dining room and another in the kitchen. Sophia Italian Bistro has such a dream team. Riccardo Sanseverino was the captain in charge of the dining room at Tesoro in Westbury for many years. His partner at Sophia, Enrique Bermeo, was the chef at Luigi Q in Hicksville for over a decade. These two first-time restaurateurs opened Sophia in Amityville in early September. They took over the building that was most recently occupied by Villa Avanzo. In the late 1960s this site was home to Vesuvio, a restaurant owned by Mr. Sanseverino's in-laws. The white-tablecloth interior consists of two rooms, separated by an attractive brick wall: one, a dining room, and the other, a bar, which also offers eight tables. Large mirrors placed throughout expand and brighten the space. The draw for me, though, was Mr. Bermeo's food. I was not disappointed. Tops among the dishes sampled were three seafood appetizers. My favorite was the grilled octopus. It was fork-tender, served warm and marinated in olive oil, garlic, lemon and parsley with an added fillip of halved cherry tomatoes. Four pan-seared sea scallops encircling a chopped tricolor salad with tomatoes, and an appealing special of smoked salmon Carpaccio, topped with an arugula salad and capers, were also first-rate. A creamy tiramisù (left) and roasted branzino layered with sprigs of thyme with a sauceboat of lemon, garlic, fresh herbs and olive oil (right). A heartier, vegetarian opener, slices of eggplant lined with pesto and served with fresh ricotta and mozzarella in a lush tomato sauce, was excellent. Salads also delivered. The Caesar was a classic with farm-stand-fresh crunchy romaine, homemade croutons and a just-right dressing. The chopped vegetable salad with tomatoes, onions, mango and cucumber surrounded by slices of avocado, all in a lime vinaigrette, also impressed. Unfortunately, the winning streak slowed down with the entrees. A special of linguine with clams and small lobster tails was sabotaged by its large, chewy clams. Another disappointment was the chicken Brie, a grilled chicken breast with melted Brie, sliced apples, and an overly sweet berry reduction sauce. The wild rice on the plate nearly saved it but couldn't manage to balance all that sweetness. My favorite entree was the grilled-to-order rack of lamb in a lush brown sauce. Also impressive was the whole roasted branzino layered with sprigs of thyme and served with a sauceboat of lemon, garlic, fresh herbs and olive oil. One special, the tender pork shank served with creamy risotto, hit the right notes. And those who want a light meal will appreciate the five perfectly grilled shrimp served with spinach sautéed with garlic. Delicious. Desserts, except for ice creams and sorbets, are made in house. An Italian cheesecake with a thick topper of chocolate was not creamy enough but a luscious tiramisù excelled in that department. 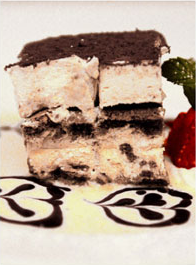 Sophia Italian Bistro has an attentive staff in the dining room and a talented chef in the kitchen. Because of this “dream-team” effect, an evening there can be quite an enjoyable one. THE SPACE Two white-tablecloth areas — the bar and the dining room, both with oversize mirrors on the walls — seat 110 people. Restrooms are not wheelchair accessible. THE CROWD Couples and small groups. There were no children on the nights of my visits. THE BAR A separate room, with 10 stools and eight tables for dining. There are 32 bottles on the wine list ($25 to $95 with more than half under $40) and 11 wines by the glass, $8 to $10. THE BILL Lunch entrees are $13 to $18. For dinner, pastas are $15 to $25; other entrees are $20 to $40 with half in the $20s. WHAT WE LIKED Smoked salmon Carpaccio, eggplant rico, grilled octopus, pan-seared scallops, Caesar salad, vegetable salad, roasted branzino, pork shank, rack of lamb, grilled shrimp over spinach, tiramisù. IF YOU GO Lunch: Tuesdays through Fridays, noon to 3 p.m. Dinner: Tuesdays through Thursdays, 4 to 9:30 p.m.; Fridays and Saturdays, until 11 p.m.; Sundays, 2 to 9 p.m. Reservations are recommended. Parking is on the street or in a large lot behind the restaurant. Drivers can access the lot by going behind South Shore Auto Sales to the east of the restaurant, which has a rear entrance. Sophia Italian Bistro has opened in Amityville, a collaboration between two veterans of the Nassau County Italian restaurant scene. In the kitchen is chef Enrique Bermeo, who earned 3 ½ stars when he was cooking at Luigi Q in Hicksville. 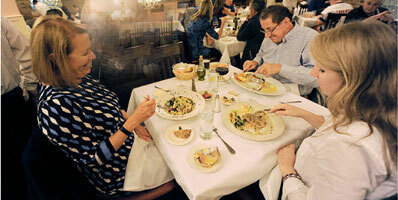 The dining room is the domain of Riccardo (Richie) Sanseverino, formerly of Tesoro in Westbury. 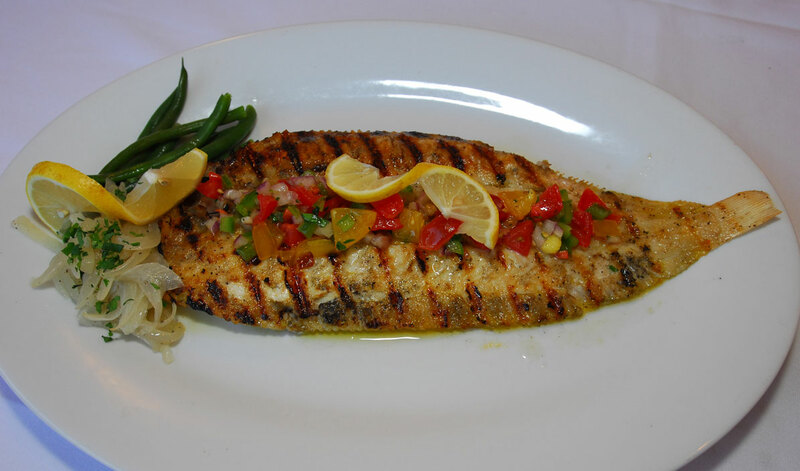 Bermeo's menu is composed mostly of modern and classic Italian-American dishes -- clams oreganata, tuna carpaccio, tre colori salad, penne vodka, gnocchi pesto, veal Francese, roasted branzino. Most starters are less than $15, most pastas less than $20, most main dishes less than $26. Villa d'Avanza was the last tenant of this Merrick Road spot. The new owners gave the dining room and lounge a much-needed update, replacing the 1980s era decor with lots of warm wood and brick. Back in the 1960s, the spot hosted a restaurant called Vesuvio, whose owners, the Gandiosi family, were the grandparents of Sanseverino's wife. "Sophia" was the name of his wife's late aunt, who worked behind the bar and also became a second mother to the young couple. Sophia's photograph graces the back of the menu.